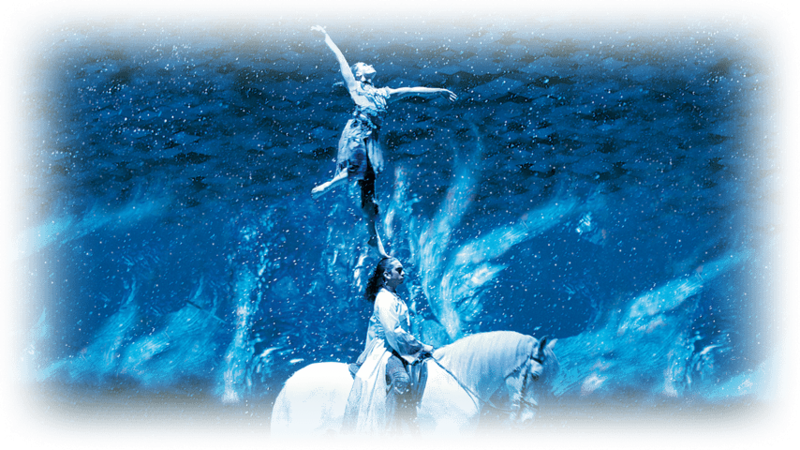 Cavalia – The Greatest Show I’ve Ever Seen! It all started with the billboard on the way to the climbing gym. After a few weeks of seeing it, I finally remembered to look it up. 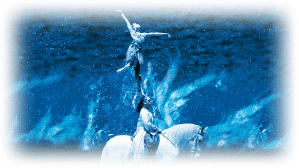 It looked like a cool combination of circus horse tricks, dressage, and cirque du soleil acrobatics. Despite the exorbitant ticket prices, we decided that if we were going to go to this show, we’d get good seats and pay the top dollar. After waiting for my final work schedule, we picked a date and Derek got us great seats! Front and Center, hell yeah! 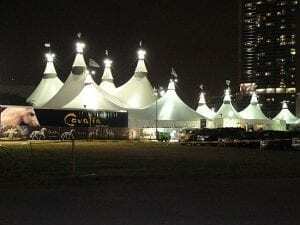 I saw the white big top a couple weeks beforehand at Marymoor Park. They weren’t kidding about “big top”! It’s 10 stories high and the stage is as wide as a football field. It seats 2000 guests. Since we got the most expensive type of ticket, the “Rendezvous”, we were treated to unlimited free drinks and heavy hors d’oeuvres… shrimp, pasta, salads, cheeses, lots of food to feast on before the show. We found our seats and Derek found another positive for the front-row seats – there was absolutely no leg-room for the rest of the rows. I just liked not having to worry about a tall person sitting in front of me. The stage floor was the same level as we were sitting, but there was a short 2 foot wall separating us from the area/stage. 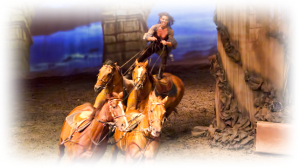 The floor of the stage was like damp sand that often flew up in the air and over the wall when churned up by running horses. Being so close to the action really added to the experience! We could smell and hear the horses, see the cues from the handlers and feel the breeze from the running horses. Each act had a theme with appropriate lighting, live music, and effects. 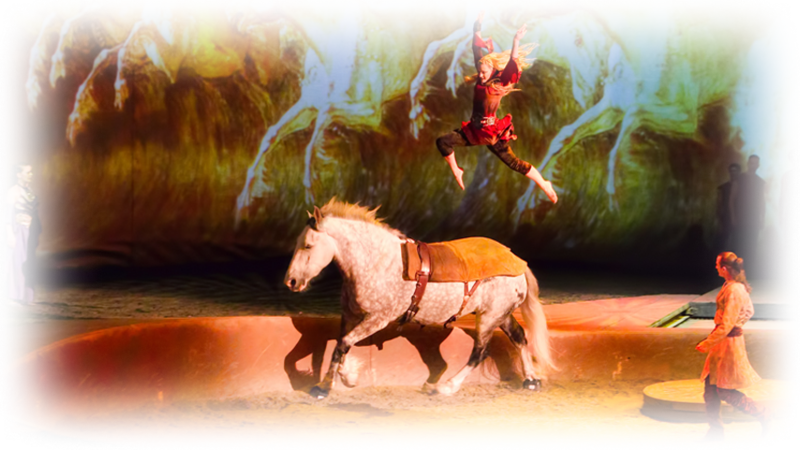 One featured spotlights that shined on a sheet of water coming down in the middle of the stage that portrayed a silhouette of a horse running and playing. A real horse would alternate with it, coming in and out of the darkness in time with the silhouette. The acrobatics were impressive! The strength and poise of the artists mirrored the power and grace of the horses. Their costumes and makeup fit perfectly with the show. 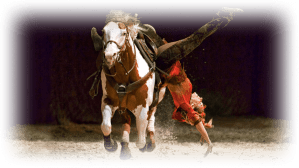 It was very apparent that the horses were treated with care and respect by the handlers and artists – why else would a 1000 pound animal run in circles two by two with his buddies without any harness to guide him? The two hour show was divided by a 30 minute intermission where we were treated to truffles, cookies, fruit, and cheesecake (I was not going home hungry!). Afterwards, we toured the stables where the horses were chowing down on hay. 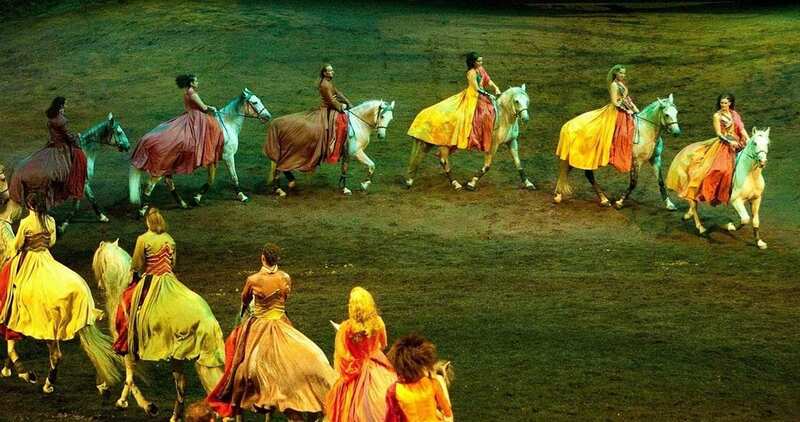 With cozy blankets on and manes braided, it was tough to recognize the horses we saw perform. The stables supposedly held 60 horses, which is quite impressive considering it’s all just under a huge tent. We were both really glad we took the opportunity. I hope my report helps out anyone who is researching the show! It’s definitely recommended! Feel free to leave your comments if you’ve been. Definitely check out Cavalia’s website too – there are some videos and a photo gallery. 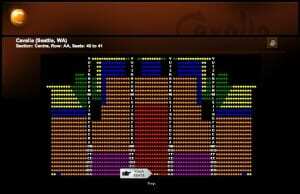 They extended their show in Seattle due to high demand, so get your tickets and go enjoy it!